Are you Gifted and Talented? We are all gifted! Remember those kids in school who were in the “Gifted and Talented” program? I was never one of them. But, at some point in my life journey, I have discovered that I do indeed have gifts and talents. Have you discovered yours? 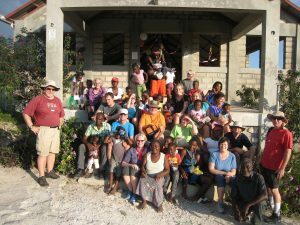 At the beginning of this month, I was in Haiti on a mission trip with my church, St. Andrew Lutheran in Eden Prairie, MN. I went because my niece, Deb Hetherington, was the lead volunteer, having been there twice before. She has cherished her experiences and I wanted to share it with her. I had heard stories from past participants. I watched with interest and concern as hurricane Matthew pounded the island. Young people in our group who had been to Haiti previously described the experience as “a blast!” I was not expecting that response when I signed up and would not use that phrase to describe it now after having been there. I can assure you, however, that it was very worthwhile, meaningful and memorable. My goal was to have a common experience with someone special to me and to bring myself authentically to the events in order to contribute to the common goal of sustainable accompaniment with the people of Pasquette, Haiti. Knowing full well what my gifts are in these circumstances, I signed up to help with the children’s programming, and not to repair the well or paint the bakery building. We planned to play, entertain and teach children ages 3-13 during the time they were not in school. We did not know for sure how many would show up each day, but planned for 25. Our first surprise was that all but 1 child went to school. This was a different and exciting circumstance. School attendance is not compulsory in Haiti and costs $500/year, on average. When you consider that the average annual income in Haiti is around $1,700, that represents a major commitment and sacrifice on the part of families – especially if you have more than one child. So we were surprised and very pleased that we had our mornings to prepare and engage in other activities. I chose to play with the child who did not attend school each day. What did we do? The language barrier between Creole and English was challenging. We did have a native translator and Deb has become quite proficient in Creole – but they were not always side by side in our tasks, so facial expressions and gestures were creatively engaged to accomplish what was needed. For one-on-one interaction, we had coloring materials: paper, coloring books, markers, crayons and pencils. We had play dough, Tenzi dice and Jenga blocks. We brought puzzles of varying difficulty. Group time included activities related to the Christmas story and various crafts. We planned to use music and movement as transitions. Colorful scarves and a parachute were successful accessories. Color and Shape Bingo and making elastic band bracelets were also popular. Basically, anything we took out was hungrily snatched up by those present. Maintaining order was not always an easy task. I found the children of Pasquette to be bright, eager for engagement and willing to participate in activities. What GIFTS did I bring? My enthusiasm for children was primary and my willingness to be open-minded and present to whatever happened was key to flexibility when things did not quite go as planned. I must admit that as the oldest female in the group, my ability to get onto and off of the floor (which was the only play area) was an attribute I did not consider when I signed up for the trip, but am eternally grateful for all my efforts to remain fit as I age. We all have GIFTS. Yours are unique to you and every day you have the opportunity to give them away. Find those opportunities and be grateful for the giving.